When choosing a watch to buy, there are many details to consider. For example, your budget is an important factor because prices can vary significantly. Another key element in the decision-making process is what activities the timepiece will be used for. If extreme sports are an important part of your lifestyle then a durable, water resistant watch is probably essential. Personally, I always purchase a timepiece based on the aesthetic and am not influenced by current trends. Essentially this means that I never get bored with the design and can enjoy the watch for many years to come. Here are four timepieces that I would be proud to own. 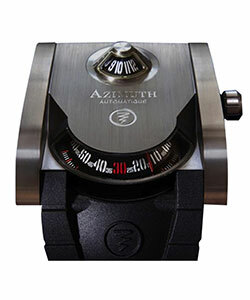 In a relatively short amount of time Azimuth has established itself as a high-quality contemporary watchmaker. All of their timepieces show a lot of creative flair including the sensational SP-1 Landship. This watch has a massive grade 5 titanium case measuring 51mm x 44mm. What makes this watch so extraordinary is the way time is displayed. Minutes are presented in a retrograde format and hours via a vertical drum (positioned on the top of the watch). Beneath the futuristic façade lies a modified Swiss made ETA 2824-2 self-winding movement. Get the SP-1 Landship here. When Frank Bürgin originally launched CX Swiss Military he wanted to achieve great things. Certainly the creation of their world record holding 20,000 Feet timepiece has fulfilled this goal. Dimensionally the watch exudes mammoth proportions and has a solid titanium case measuring 46mm x 28.5mm. 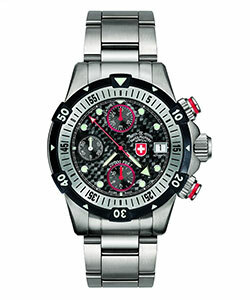 What makes this timepiece so exceptional is the sleek carbon fiber dial with sporty red sub counters. Other features include a Unidirectional rotating bezel, Helium release valve and oversized crown. Powering the watch is an ETA 7750 (Valjoux) mechanical automatic chronograph movement. Get the 20,000 Feet here. 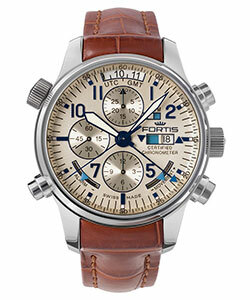 Fortis have an exceptionally long history of manufacturing high quality and stylish timepieces. The superb Aviatis Daybreaker Recon is one of their most exclusive designs that perfectly illustrate this point. With an elegant 316L stainless steel case measuring 43mm, the watch should appeal to a wide variety of buyers. What makes this timepiece so distinctive is the beautifully decorated gold dial with contrasting blue numerals. Other fine details include chronograph timers, GMT, day/date and alarm indications. At the heart of the watch is a complicated mechanical self-winding movement containing 500 individual components. French brand B.R.M (Bernard Richards Manufacture) is synonymous with the production of stylish luxury timepieces. Recently the company has teamed up with Corvette® Racing to produce a phenomenal watch, limited to only 100 pieces, called the V12-44-Corvette. This timepiece has a well proportioned 316L stainless steel case measuring 44mm. 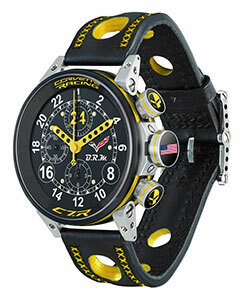 What makes this watch so special is the sleek matt black dial with large white numerals and Corvette logo. Other striking features include an oversized crown displaying the American flag and lightweight drilled yellow hands. Beneath the cool exterior lies a Swiss made automatic chronograph movement. Get the limited edition V12-44-Corvette here. Choose the watch that's best for you, check out our full range of watches.